The era of social media provided us the opportunity to stay connected to anyone and everyone that we would otherwise rarely see. Missing that friend who moved to the other side of the country? You can keep tabs on each other even when life gets busy. Thinking about that co-worker you got along with so well? You get to stay in touch and keep helping each other over the long run. It’s all awesome (for the most part) but the biggest critique of any social media platform is that it can’t really connect people beyond clips and quotes. 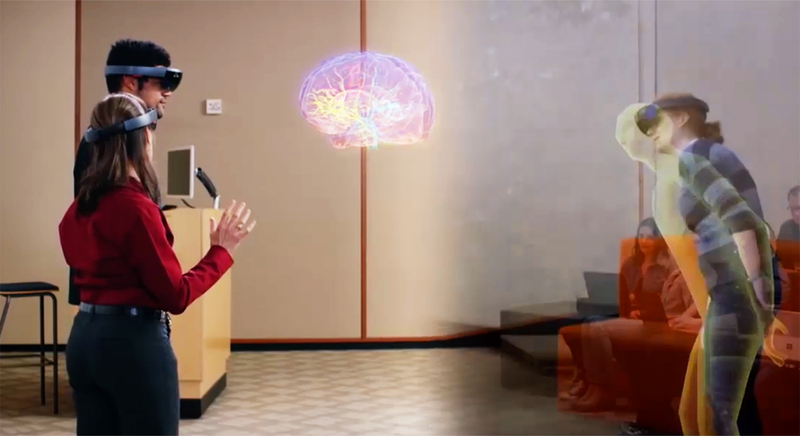 Now that Mixed Reality technology has the potential to weave its way into social media (more on that in our Facebook VR post) you will have opportunities for more authentic moments of actually being present with someone you couldn’t otherwise see in person. The Microsoft video above illustrates professional design collaboration, but the technology can be used for personal experiences as well. We predict it won’t be long before Skype, FaceTime, and other popular video chat applications take their products to the Virtuality level. As our social and work lives evolve, separately and together, the use of MR conferencing will apply to everything from a boardroom meeting to a family reunion. We have all complained in one setting or another about someone getting drawn into their phone and ignoring the moment. We also anticipate MR bringing online content out of the phone, making it a shared experience. While we know people won’t always want to sacrifice the personal freedom and privacy of content that stays discreetly behind a screen, the chance to visually share ideas, art, products, stories, news, and more, will be a blessing for years to come. Think of it this way; the concept of sharing your screen – remotely or in person – will spring to life in three dimensions. Building the companies and organizations of the future will rely more on putting together the right team than making use of the people in your area code. We all know that working with the most skilled and experienced like-minded peers who inherently ‘get’ your product and company culture is practically priceless. Another example from Microsoft (for Ford) illustrates how designers can not only collaborate with each other, but simultaneously experience what a driver would experience on the road. In the scenario above, MR facilitates the best combination of team dynamic, creativity, and visualization efficiency. So how will you incorporate Mixed Reality into your life and work once the hardware proliferates into the hands of almost everyone? Stambol works with Mixed Reality technology and we’re ready to help you apply it in whatever way works best for your business.